Hundreds have been arrested in the Democratic Republic of Congo in the aftermath of deadly clashes Saturday surrounding preliminary election results. Phuong Tran reports for VOA from Dakar. With only 10 percent of the vote left to be counted, and preliminary election results showing presidential incumbent Joseph Kabila leading with nearly 60 percent of the vote, supporters of his opponent, former rebel leader Jean-Pierre Bemba, are making accusations of election fraud. Bemba supporter Eve Baz claims votes in the October 29 election were not counted properly, especially in eastern Katanga province. "When you look at the results for a polling station, they appear okay, but do not correspond to the overall count," she said. "By going through the details, vote by vote, we can see that there are inaccuracies, missing information. The numbers are not correct." Election officials say they are reviewing complaints from Bemba's camp and that these reviews may delay the release of final results. Saturday, protests that resulted in several deaths erupted outside Bemba's residence in Kinshasa. Witnesses report that police rounded up more than 300 demonstrators, including minors. 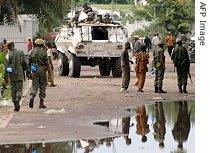 To prevent a repeat incident, the government has banned all public gatherings in Kinshasa. Despite the unrest, the European Union is maintaining its schedule to withdraw its small rapid reaction force from Congo, starting at the end of the month. Germany's defense minister, Franz Josef Jung, says he believes the EU mission of securing the elections has been achieved. The large, but sometimes beleaguered, U.N. peacekeeping mission asked for the EU presence.